Buy A Cat, A Book, And A Cup Of Tea a Coffee. ko-fi.com/acatabookandacupoftea - Ko-fi ❤️ Where creators get paid by fans, with a 'Buy Me a Coffee' button. Hi! 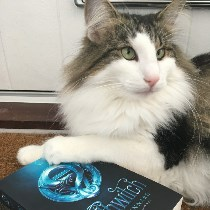 I'm Asha from A Cat, A Book, And A Cup of Tea, where I blog about all the books I'm reading (and it's a lot)! Find me @cat_book_tea on Twitter, or follow my blog at acatabookandacupoftea.wordpress.com. Secured Payments. Support goes to A Cat, A Book, And A Cup Of Tea's account. Upgrade A Cat, A Book, And A Cup Of Tea to a yearly Gold Membership with a one-time payment.